The Termite Swarms Are Coming! Is Your Home Protected? There’s a reason why March 11 – March 17 is National Termite Awareness Week. We are only 2 to 3 weeks away from the dreaded, yearly swarm by subterranean termites. If you see a swarm of termites, usually outdoors around your windows and doors, it may mean that your house has a termite infestation and you should schedule a termite inspection. It also means that your infestation is about to get worse. Because the purpose of the termite swarm is to start a new colony. She also says that homeowners should have “a licensed pest control professional assess your property annually for potential termite issues.” We could not agree more. Call Bug Authority at 615-472-1292 now to schedule a termite inspection. One of our certified termite inspectors will set an appointment at your convenience. As a locally owned and operated company we offer a termite inspection Franklin TN homeowners can trust because our business is built on relationships. Termites are one of the most destructive insect species to impact homeowners here in the U.S. 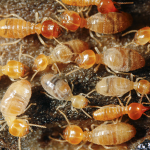 In the U.S., termite infestations cause more than $5 billion in property damage every year. And these costs typically are not covered by homeowners insurance. If you have any doubts about what termites can do to your home, you should check out the Tiny House Termite project done by the NPMA. They designed a custom, built-to-scale, miniature dream house, and dumped nearly half a million termites into it. With a mix of high-definition video and photography, they are documenting the destruction as the termite colony wreaks havoc on the home. *Note: Two and three-year-old “new” homes in Brentwood, TN may already have termite infestations. Learn why here.